While President Trump’s trade war with China (and most every other country) has had little impact on the stock market here in the United States, it has had a very noticeable impact in China. Since the start of 2018, while the S&P 500 is up more than four percent, the Shanghai Composite Index has actually sunk by more than 15 percent, with most of the decline coming in recent weeks as President Trump’s tariffs have been unleashed. A fifteen percent stock market decline in six months is a major move, even for an emerging nation. If the U.S. market had dropped by 15 percent over the same time period it would be major news. 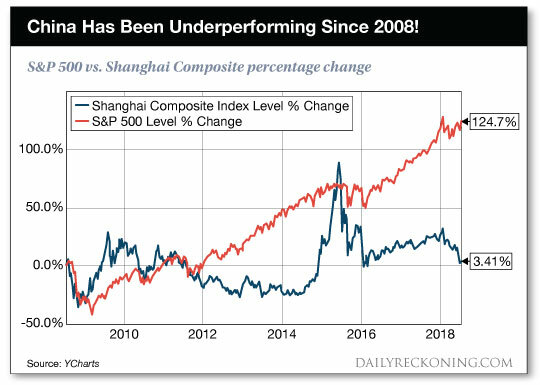 The chart below details the performance of the S&P 500 and the Shanghai Composite over the entire last decade. While the U.S. market is up 125 percent, the Chinese market is flat — up just 3 percent over the last ten years despite an economy that has continued to grow. With that kind of underperformance (both recent and long-term), you can bet that there are some serious bargains to be had in Chinese stocks. President Trump’s tariffs are focused on goods that get exported to the United States. Those tariffs aren’t going to have any impact on the demand for goods and services that are sold within China. Yet, Chinese stocks that operate only within China have been sold off along with the overall market, in the face of China’s fast-growing middle class and high consumer demand. That doesn’t make sense, and thus, an opportunity (or two) is born. Based in Shanghai, GreenTree Hospitality was originally founded in 2004 to provide mid-level hotel accommodations in the Shanghai region. Since its founding, GreenTree has grown rapidly to become the fourth largest network of economy to mid-scale hotels in China. The company’s network boasts 2,354 hotels with 195,552 rooms in 263 different Chinese cities. GreenTree is a “pure play” hotel franchisor. Almost 99 percent of the hotel network is operated not by GreenTree itself, but by franchisees. I like that business model because it is capital light and able to generate free cash flow. The franchise model also allows for a much higher rate of growth since the company doesn’t have to finance the building of the hotels themselves. Having the rights to the KFC trademark in a country of 1.2 billion people where chicken is the by far the preferred source of protein is a nice position to be in. That is where Yum China Holdings finds itself with the exclusive right to operate and sub-license not just the KFC brand within China, but also Pizza Hut, Taco Bell and two Chinese concepts (East Dawning and Little Sheep). 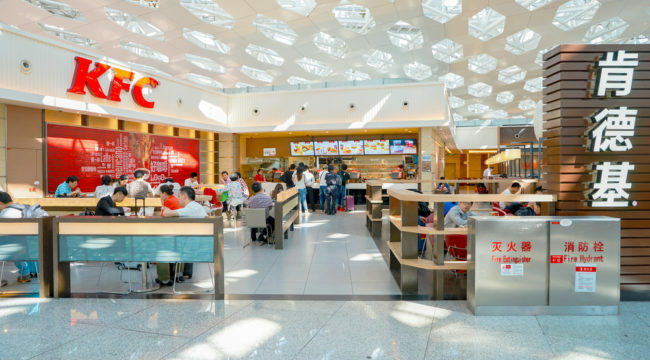 From a single location in 1987, Yum China Holdings now operates 8,100 restaurants that are spread across 1,200 cities in China. The corporate plan is to at least triple that current restaurant count in the coming years. Having operated for decades within China has created a big advantage for the company. Over the past thirty years, Yum China Holdings has created loyalty amongst consumers in China and has integrated its brands into popular culture. Yum has created this loyalty by not forcing American tastes onto the Chinese people, but instead tailoring menus to cater to local preferences. 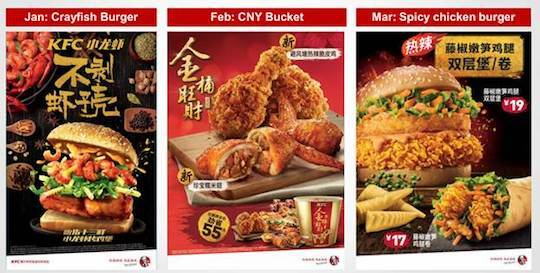 Perhaps you have been to China and tasted KFC’s popular Crayfish burger? Maybe not. Either way, Trump’s trade war has knocked nearly a third off the market cap of both of these companies yet hasn’t impacted their future growth prospects one bit. That is an appetizing dish no matter what your cultural tastes may be.